So, I looked back at Issue 56 and read, once again, about the low pressure fuel delivery/fuel transfer pump systems used on our Turbo Diesel trucks. Four years later, other than the price and availability of parts, nothing has changed in the fuel transfer pump saga. 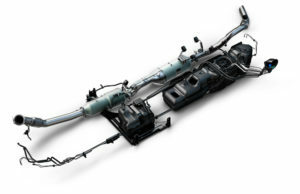 Over the past nine years, many of us TDR members have been introduced to the new high pressure, common rail (HPCR) fuel system used on the 2003 and later model year Cummins B-series engines. For example, way back in Issue 38, G.R. Whale mentioned the HPCR system and its multiple fuel injection events for a single cycle and Robert Patton quantified the quieter character of the new engine in the Ram. A few characteristics of the HPCR fuel system were mentioned in Issue 39, page 24. 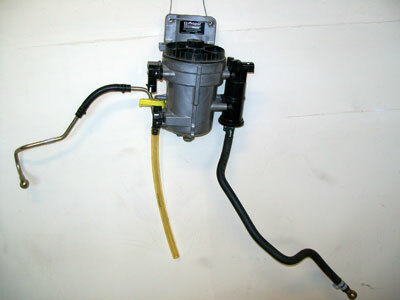 Formerly, the ‘98.5-’02 24-valve Cummins engine relied on the Bosch VP44 pump to pressurize and distribute the fuel to each cylinder. These tasks proved difficult to accomplish with a single, compact unit, and durability was less than optimum. For the new HPCR engine, Cummins is again using a Bosch fuel injection system, but this time the high pressure pump does only that one thing—pressurize fuel. 72i1. The rear of the Bosch CP3 high pressure pump showing the finned cover of the gear type pump at lower right. The Fuel Control Actuator is lying on the pump and attaches on the rear left side of the pump. This is a much simpler task and high pressure pumps are matured products. They can readily be made both durable and reliable. The Cummins electronic control system (ECM or engine control module) is also a proven electronic product. 7212. The driver’s side of the 2003 HPCR Cummins engine. 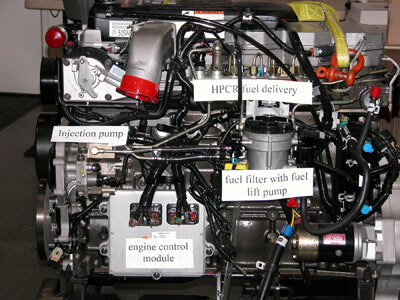 The injection pump, engine control module (ECM computer), HPCR fuel delivery system, and fuel filter with fuel “lift” or transfer pump are labeled. The HPCR injectors are electrically opened and closed. Pressurized fuel is fed to both sides of the needle-and-seat control shaft, so the solenoid does not have to be very powerful, which would be required to overcome a high pressure differential if only one side of the needle valve were being fed fuel. 72i3. Bosch injector for the HPCR system. The extra height of the injector for the new common rail system, compared to older style mechanical injectors, accommodates the electrical control mechanism to open and close the injector. Prior designs on our Turbo Diesels used fuel pressure to open and close the injector. Electrically operated injectors have been commonplace for a couple of decades in gasoline engines. Again, the technology is reasonably durable and reliable, in addition to being the only practical solution to federal and state emissions mandates. In Issue 40 of the TDR we were introduced to the HPCR engine from an emissions perspective. The HPCR system has a rail pressure of up to 23,200 psi (1600 bar). The multiple injection events under such high fuel pressure result in a reduction of 8-10 decibels of noise. Improved injection timing and pilot injection widens the peak torque band by 400 rpm compared to the earlier ’98.5-’02 24-valve engine with the VP44 injection pump. The high pressure pump supplies fuel to the injectors through the common rail. 72i4. The high pressure fuel rail with the pressure relief valve above it on the left. In the center are the shortened wrenches used to remove the #6 fuel line while clearing the cowl of the truck. The #6 line is threaded into the rail and an injector connector tube. The injection event is controlled by the engine control module. With the previous Turbo Diesel engines (’89-’93 Bosch VE fuel pump; ’94-’98 Bosch P-7100 fuel pump and ’98.5-’02 Bosch VP44 fuel pump), fuel pressure pulses control the injection events. The HPCR fuel system gives higher peak cylinder pressures, so the engine block was strengthened and stiffened with sculpted side walls, stiffening rails, and a stiffener plate across the oil pan surface, just below the main bearing caps. The HPCR system consists of five main components: electronic fuel lift pump, fuel filter and housing, fuel pump and fuel pump gear pump, fuel rail, and fuel injectors. Fuel travels from the fuel tank to the fuel “lift” pump which pressurizes the fuel to about 10 psi. The fuel then enters the fuel filter, and next travels to the high pressure pump (CP3). A gear-type fuel pump under the finned cover on the rear of the pump raises fuel pressure to 80-180 psi. The fuel from the gear pump is then supplied to the electronic fuel control actuator (FCA). 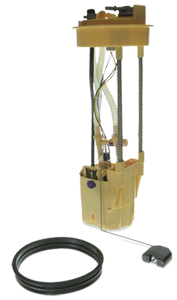 The electronic fuel-control actuator (FCA) is an electronically controlled solenoid valve. The ECM controls the amount of fuel that enters the high pressure pumping chambers by opening and closing the electronic fuel-control actuator based on a demanded fuel pressure. 7215. 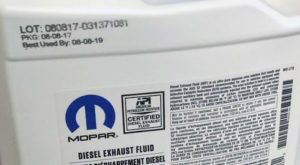 The electric fuel transfer (lift) pump used from 2003-4 is on the side of the fuel filter canister that faces the rear of the engine. The 2005-up models use a fuel transfer pump mounted inside the fuel tank. The Bosch high pressure CP3 fuel pump (see picture 72i1) is mounted with three studs to the rear of the front gear case of the engine. 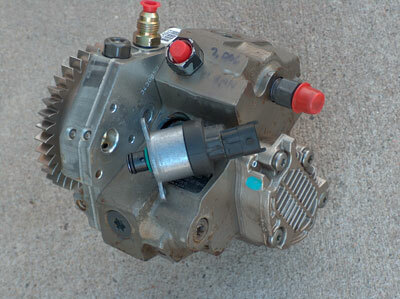 The fuel pump is gear driven at a 1:1 ratio with the crankshaft; however, it is not timed to the engine. Therefore there is no need for a key-way in the drive gear. The gear is attached with a nut and washer. The CP3 fuel pump uses an O-ring seal to contain engine oil inside the gear case, where it mounts on the gear cover. Prior design fuel pumps were driven at camshaft speed (one-half of engine speed). The new gear case is also different in that it is indexed to the engine block by two dowel tubes inside the bottom two mounting bolts. There are no dowel pins for indexing the gear case, as was done previously. Hence, the concerns about the “killer dowel pin” (a potential problem with the previous engines ’89-’02) falling out onto the gears do not exist for the new engine. The pressure sensor on the fuel rail monitors the actual fuel pressure and sends an electrical signal to the ECM. When the actuator is opened, the maximum amount of fuel is being supplied to the high pressure pump. Any fuel that does not enter the high pressure pump is directed to the cascade overflow valve. The cascade overflow valve regulates how much excess fuel is used for lubrication for the pump and how much is returned to the tank. The fuel that enters the high pressure CP3 pump is then pressurized to between 300-1600 bar (4, 251-23, 206 psi) by three radial pumping chambers. The pressurized fuel is next supplied to the fuel rail. Fuel is pressurized in the CP3 fuel pump to a maximum of 1600 bar (23,206 psi) and then travels through the fuel rail supply line to the fuel rail. The fuel pressure at the fuel rail is monitored by the rail pressure sensor. If the pressure becomes excessive, the pressure limiting valve opens and vents excess pressure to the fuel drain circuit. High pressure fuel then travels through the injector supply lines and through a high pressure connector. 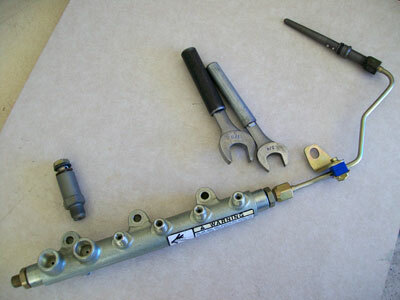 The high pressure connector contains an O-ring and locating pins. The high pressure connector pushes against the injector body when the high pressure connector nut is tightened. The injector supply line is then connected to the fuel connector. The connector tube O-ring seals returning fuel from leaking to the outside of the engine. As mentioned earlier, the engine control module controls the fueling and timing of the engine by actuating the solenoids on the injectors. An electronic pulse is sent to the solenoids to lift the needle and start the injection event. By electronically controlling the injectors, there is a more precise and accurate control of fueling quantity and timing. Also, multiple injection events can be achieved by electronically controlling the injectors. For the HPCR engines, a pilot injection event is used before the main injection event to minimize noise, improve emissions, and improve cold starting. The familiar engine block heater is now an option because pilot injection is so effective for cold starts that it may be sufficient down to -40 degrees Fahrenheit! The rocker housing is located on the top of the cylinder head. The 2003-2005 rocker housing has three pass-through connectors which connect the ECM wiring harness to the fuel injector wiring harness. 72i6. 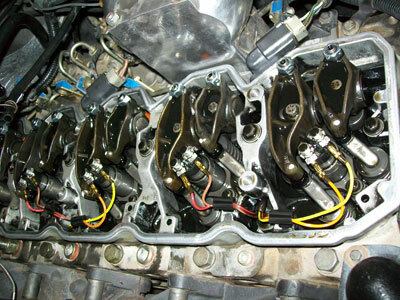 The rocker lever housing installed on an engine, with injector wiring shown for cylinders 1-3. The 2006-2007 rocker housing uses a single multi-wire connector to the ECM wiring harness. The fuel injector wiring harness then connects to the fuel injector solenoid posts. The housing is two-piece, with the lower piece remaining on the engine for normal maintenance operations. The black plastic cover on top of the aluminum rocker housing shrouds the crankcase breather system and its filter on 2003-2005 engines. The 2006-2007 engines use a one-piece molded plastic valve cover with integral filter/breather. The fuel drain circuit incorporates several fuel return paths. As the fuel travels through the fuel filter and on to the CP3 fuel pump, a portion of the fuel flows through a passage in the fuel filter housing and into a fuel drain line back to the fuel tank. The fuel that flows to the CP3 fuel pump is pressurized and sent into a passage in the fuel pump. At this point, the fuel is channeled into two passages. One passage sends fuel to the electronic fuel control actuator and the other passage sends fuel to the cascade overflow valve. The cascade overflow valve sends some fuel to a lubrication passage which is used to lubricate the fuel pump, and the rest of the fuel is sent to a drain passage which connects to an external fuel line that is connected to a fuel drain circuit via the fuel filter housing. 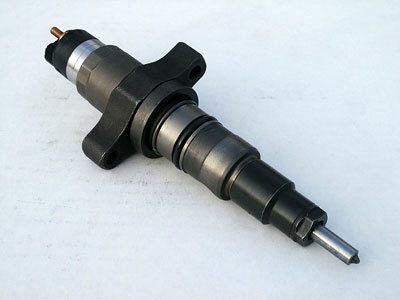 At the fuel injectors, the fuel that is not injected is used for lubrication of the injectors. This fuel then travels through an internal passage to the rear of the cylinder head and into an external fuel return line. This fuel line connects with the other fuel return lines to make one fuel return line that returns fuel to the fuel tank. The blow-off or “safety valve” on the top side of the common rail is set at 28,000 psi, whereas stock rail pressure is kept to about 23,000 psi. If pressure goes too high, the blow-off valve releases pressure and must be replaced because the check ball and its seat will become etched and no longer seal. As we look back to 1989 and the VE pump with about 10,000 psi, the P7100 with 16,700 psi, the VP44 with 14,500 psi, and now the HPCR with 23,000 psi, we see that higher injection pressures have increased fueling and power and improved fuel atomization for lower emissions. In Part Two, we have a look at previous discussions in the Turbo Diesel Register magazine and aftermarket processes.